1. 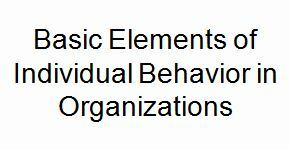 Explain the nature of the individual-organization relationship. 2. Define personality and describe personality attributes that affect behavior in organizations. 3. Discuss individual attitudes in organizations and how they affect behavior. 4. Describe basic perceptual processes and the role of attributions in organizations. 5. Discuss the causes and consequences of stress and describe how it can be managed.